In 1990, astronomer Sandra Faber diagnosed — and later helped correct — a major flaw in the Hubble Space Telescope. We talk with her about her current work on how galaxies form and evolve. Sandra Faber is an astronomer at the University of California’s Lick Observatory. She’s renowned for her studies of how galaxies form and evolve. In 1994, Faber and her colleagues began to build an enormous optical instrument called the DEIMOS spectrograph. It separates a galaxy’s light into different colors — or wavelengths. The separation helps show what the galaxy is made of, how fast it’s moving toward or away from us, and how massive it is. Faber and her team are now using DEIMOS and other instruments to make a survey of 65,000 extremely distant galaxies. Sandra Faber: Big telescopes look out into space but also back in time. And our survey is viewing galaxies as they actually were in the universe billions of years ago — more than half the way back to the Big Bang. So we are seeing infant and adolescent galaxies. And the goal is to compare them to our local galaxies to find out how galaxies formed and evolved. Faber expects the survey to take another three or four years. Sandra Faber: I think we all have a craving to put ourselves in perspective. And what astronomy is doing is, it’s providing the modern cosmology myth. …. So what we’re doing … is writing the early history of the human race — our cosmic roots. Sandra Faber is one of the most distinguished astronomers of our times. She is one of an elite group of scientists that are members of both the National Academy of Sciences as well as the American Academy of Arts and Sciences. In 1985, she was awarded the American Astronomical Society’s prestigious Dannie Heineman prize in recognition of a sustained body of especially influential research. Early in her research career Faber discovered a relationship between the brightness of elliptical galaxies and the speeds of stars orbiting within them, now called the Faber-Jackson relationship. Important concepts such as “cold dark matter” and the “Great Attractor” theory are direct results of work by Faber and her colleagues. 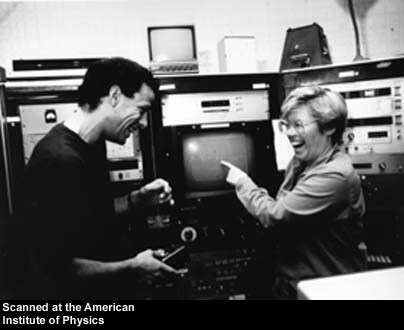 In 1990 she diagnosed and helped correct the flaw in the optics of the Hubble Space Telescope (HST) and is currently a member of the HST’s wide field planetary camera team. For nearly two decades, she helped plan and develop the twin Keck telescopes atop the dormant Mauna Kea volcano in Hawaii. Faber was instrumental in the construction and oversaw the optical design of the Kecks. 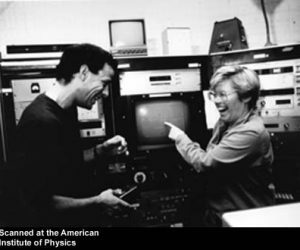 In 1994, she and her team at University of California’s Lick Observatory began to build an enormous optical instrument. The instrument, called the DEIMOS spectrograph, was designed to fit on one of the world’s largest telescopes, the Keck 2, atop a dormant volcano in Hawaii. Like a prism, a spectrograph works by separating light into component wavelengths. The spectrograph Faber’s team envisioned was unprecedented in size and scope. It would allow them to collect information about distance and movement from thousands of extremely faint galaxies, giving clues to the evolution and large-scale structure of the Universe. At 20,000 lbs., the instrument was calculated to increase the efficiency of the telescope by seven-fold. But no one had ever attempted to build a spectrograph of that size. The team built an active steering element into the spectrograph, allowing it to sense and track the telescope’s image. Without this compensation system, the images would have been useless. Instead, the DEIMOS spectrograph can gather spectra from 140 galaxies every night, the equivalent of several hundred nights of observation with less sophisticated instruments. Although perhaps a third of physical science graduate students in American universities are women, far fewer than a third go on to faculty positions at major research institutions. Researchers have concluded that the root of the problem is not any one distraction, but rather “death by a thousand little things”. Women may just have more career/life choices than men. Faber had her first child barely a year into her first job out of graduate school, an assistant professorship at UCSC’s Lick Observatory. Although she continued to teach, she didn’t produce a scientific publication for three years, a hiatus that might kill a promising scientific career today.